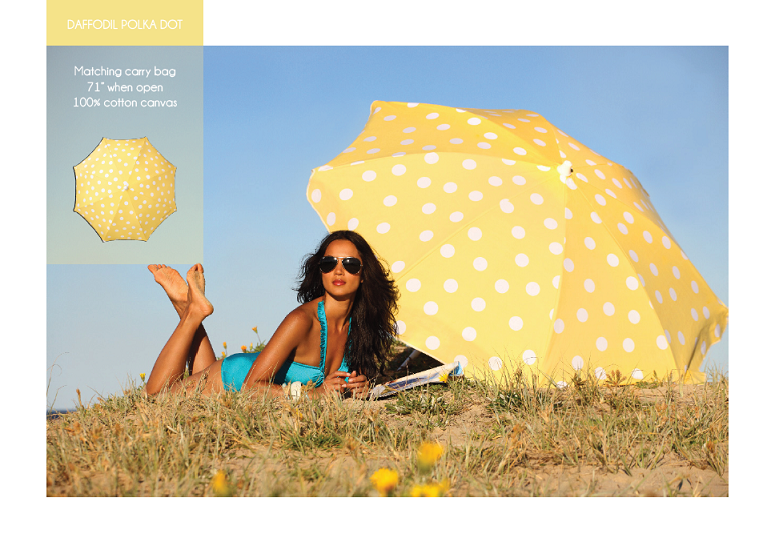 Mix and Chic: A product review and a giveaway- Cocopani designer beach umbrella! 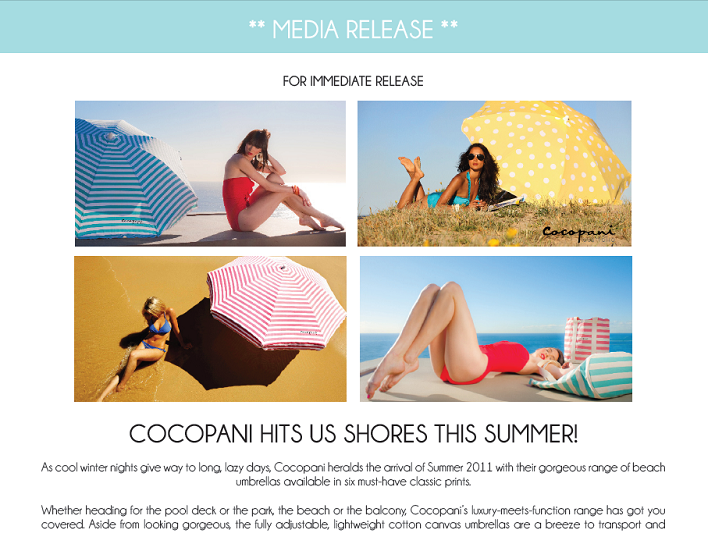 A product review and a giveaway- Cocopani designer beach umbrella! 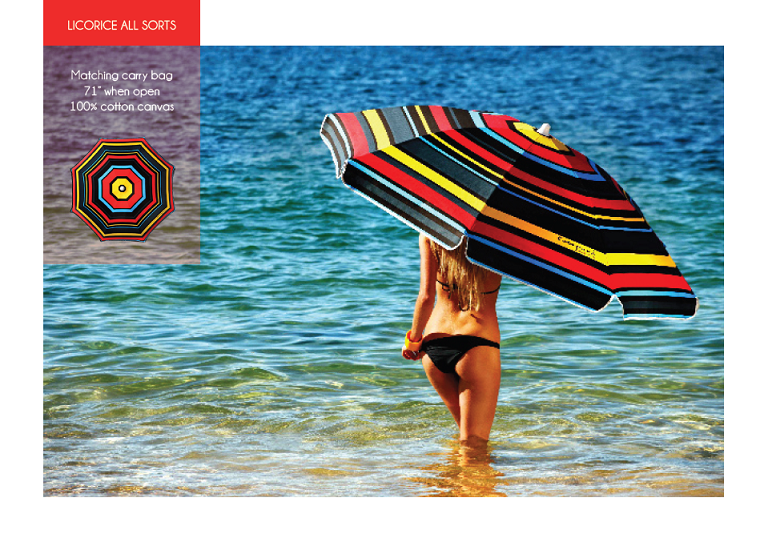 Today, I am doing a product review for a beautiful beach umbrella courtesy of Cocopani. Check out what I received in the mail a few weeks ago! 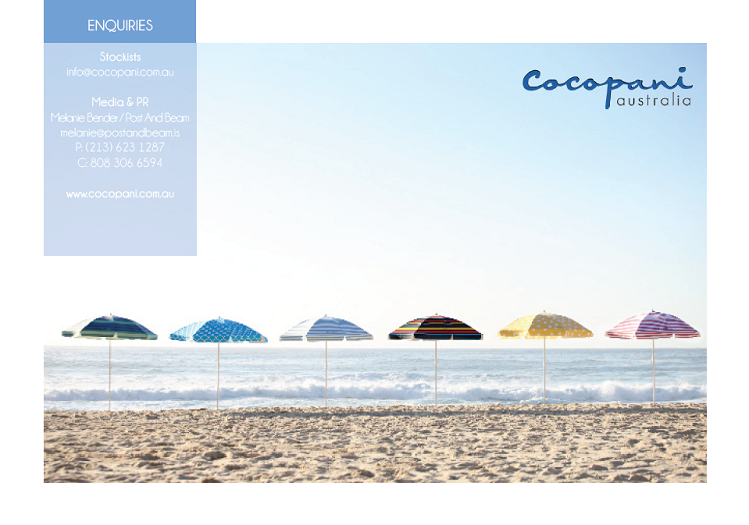 A Cocopani beach umbrella! 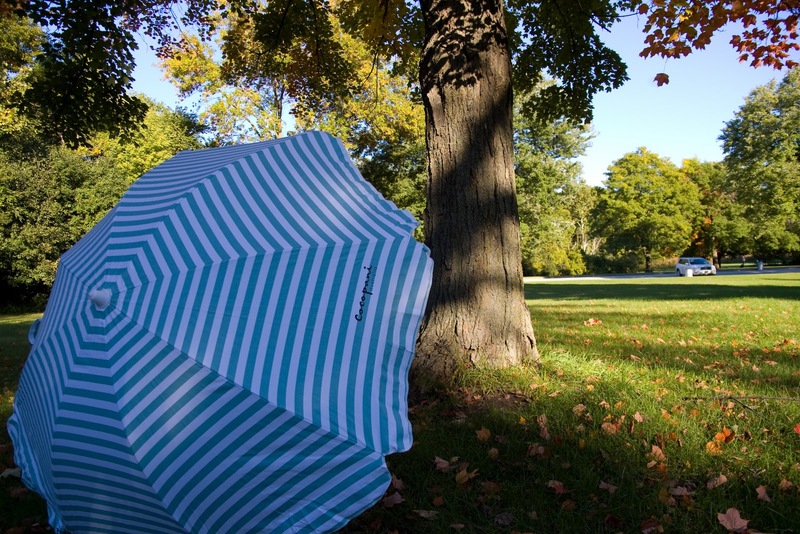 This gorgeous umbrella comes with a matching carry bag. The carry bag is made with the same cotton canvas material as the umbrella. It's lightweight and absolutely a breeze to carry from one place to another. Plus, it provides an easy storage. The interior of the umbrella. 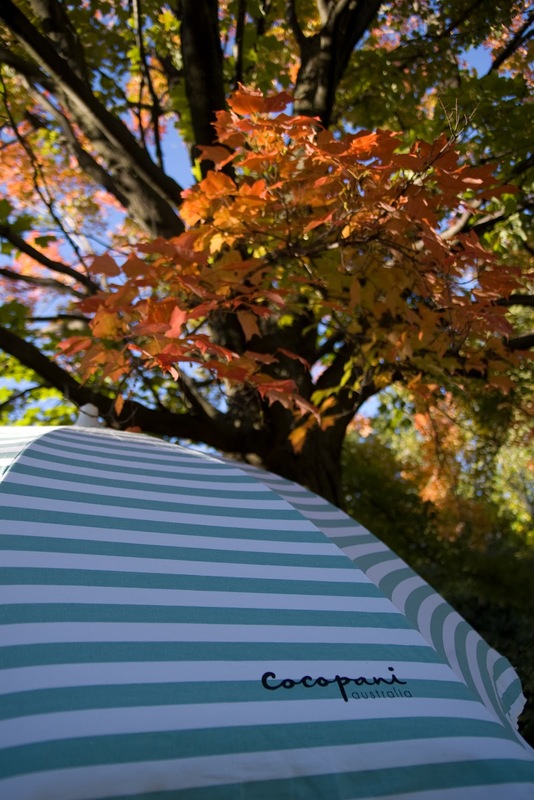 With a height adjustment feature, this umbrella is perfect for a picnic at the park, at the deck or on the beach. The material, although lightweight, is made of high quality cotton canvas. What I love most about this product besides the good quality is the size of it. The generous size of this umbrella is wonderful because I can fit my whole self in. I just love having the option of completely staying out of the sun when I am outdoor so I can read a magazine or take a short nap! Made with good quality materials in a generous size with a height adjustment feature and with six fabulous designs to choose from, this beach umbrella is a clear winner to me! * I can't wait to lounge in style underneath this beauty when I get a chance in the near future! *I received this product to review for free but the views and opinions expressed are entirely our own. 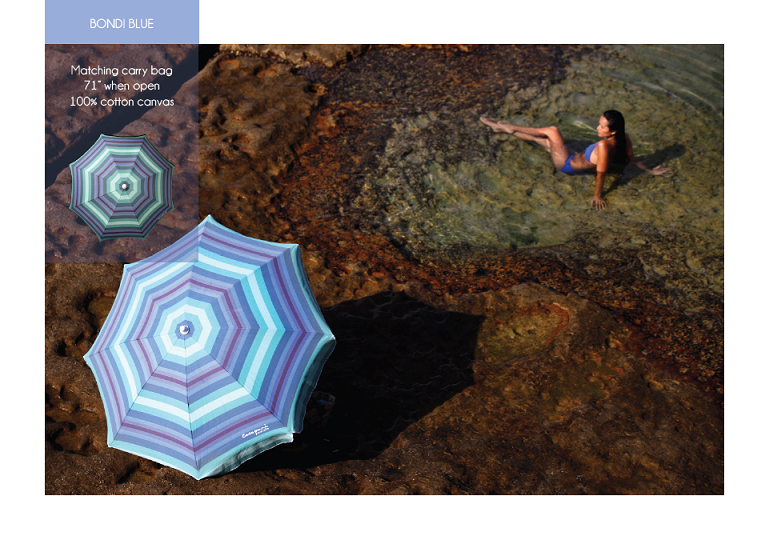 Cocopani's line of designer umbrellas and matching totes are designed by Australian model and interior designer, Bianca Cheah. Cocopani's luxury-meets-function range of beach accessories are perfect for a lazy day of lounging in style, whether heading for the pool deck, park, beach or balcony. The line's fully adjustable, lightweight cotton canvas umbrella comes in six chic prints, are a breeze to transport, and provide full UV30+ protection, upping your style and SPF factor! 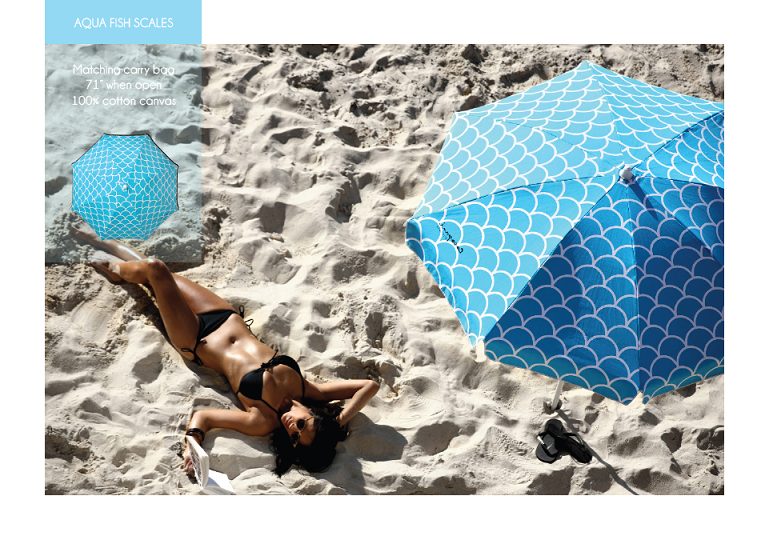 Cocopani's line of stylish designer beach umbrellas come in six prints: Licorice All Sorts, Watermelon Streak, Daffodil Polka Dot, Spearmint Stripe, Aqua Fish Scales and Bondi Blue. To make a purchase or check out their website, go here. 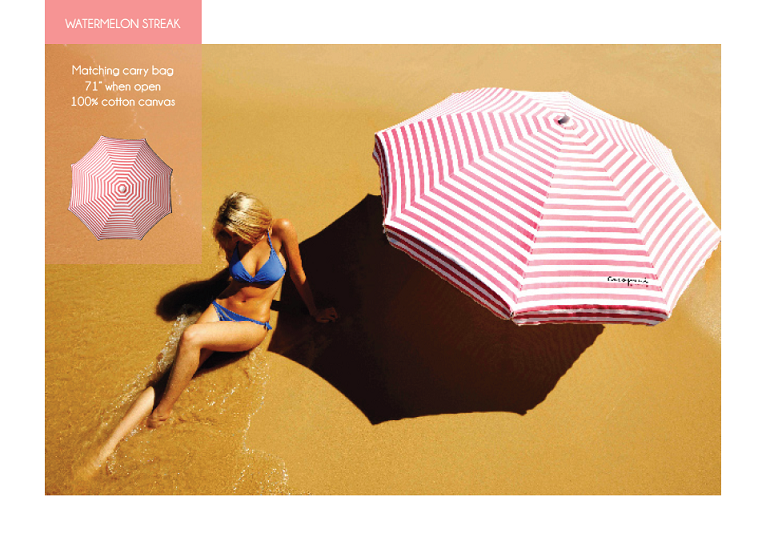 Now, my lovely readers, you have an opportunity to win one of these designer beach umbrellas (valued at $110) because the kind people at Cocopani generously offered one of these beauties to a lucky Mix and Chic reader. The lucky winner also get to choose their favorite design out of the six choices above. 2. 'Like' Mix And Chic on Facebook. 3. 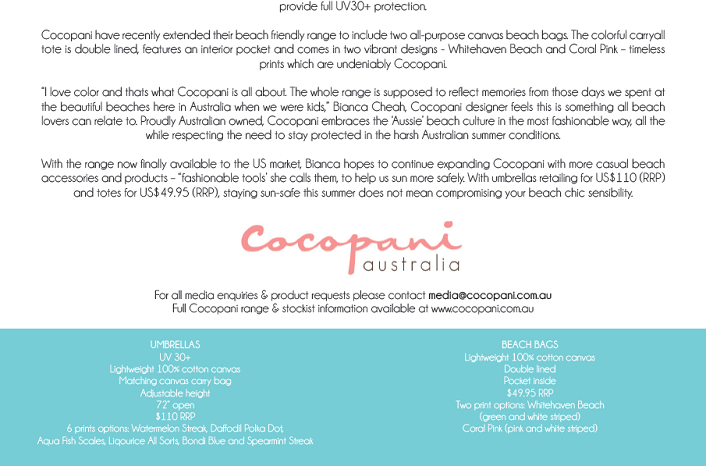 'Like' Cocopani Australia on Facebook. 4. Blog about this giveaway (include link from this post). 5. Tweet about this giveaway (include link from this post). 6. Mention this giveaway on your Facebook status (include link from this post). This giveaway is open to US residents only. (My international readers, sorry again.) The deadline for entries is October 12th. The winner will be chosen by random.org and announced on Thursday, October 13th. Good luck! Lovely unbrellas! I should get them for this summer,it's a must have item here in Australia! I would love to enter giveaway but I'm not a twitter user! Wow, they are really pretty! Would love to have such a beauty in my garden :) Pity, I´m not from US :( Good luck to everyone, however! Oh what a great line! I adore that Watermelon Stripe and its a great feature to have SPF fabric! I am follower of your blog!!! 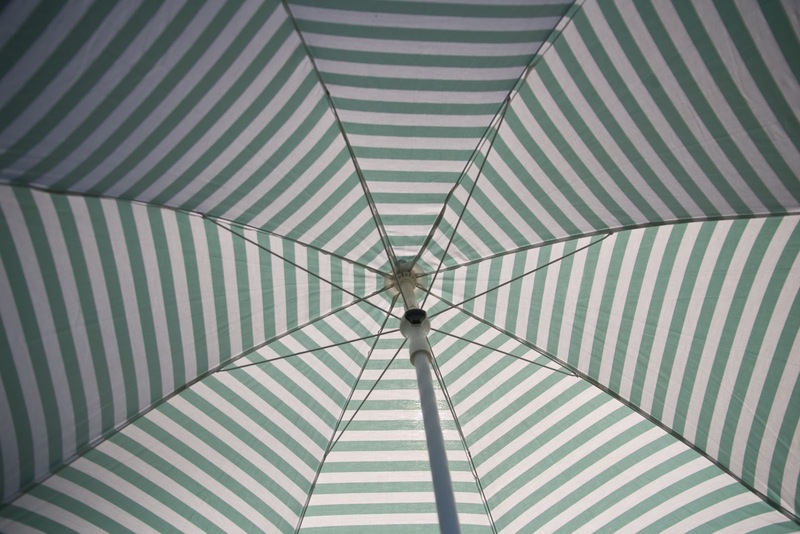 I love the spearmint stripe umbrella, so fun!!!! No way, you lucky cat!!!! I am so putting my name in the hat! Licorice Allsorts - absolutely. That is my type of candy plus I would be the most stylish lady on the beach with this almost Versace inspired umbrella. What a unique and lovely giveaway, Jessie! P.S I am already a fan, follower. What a gorgeous umbrella!! I'd pick the spearmint stripe. Enjoy relaxing under your new umbrella Jessie!! Oh, how fun! I love the watermelon streak. You know I'm a follower! Thats a tough choice !! I love the stripes and the polka dots ! Following you on twitter ! Ohhhh!!!! I love the Spearmint Stripe! How do you score such AWESOME giveaways girl?!!! Thank you! I just "retweeted" your giveaway! love it!! we're google connected! i LOVE the polka dots...and the stripes. they're all so fun! I'm a follower on your blog. These are all lovely, but I think I like the daffodil polkadot the best. They are all so fun! I like C on FB. I like M&C on FB. I am following you on Twitter. Thanks for chance to win! I'm following on FB Too! Jessie this is amazing & of course I am a follower!! A great giveaway!! very artistic! Oh I love the blue and white scallop print and I follow you on Twitter! I also Like Mix and Chic on Facebook. What a cool designer and company! I have a great giveaway ending tonight at midnight, so I hope you enter! I like Mic and Chic on FB! I like Cocopani on FB! I think perhaps my initial comment never went thru... had to reboot. So here is what I said. I follow you already on GFC! One of my fave umbrellas is the Spearmint Streak umbrella ... it wouldbe perfect for here in the South, with our yr round beach weather... The Aqua Scales... is a running second fave! 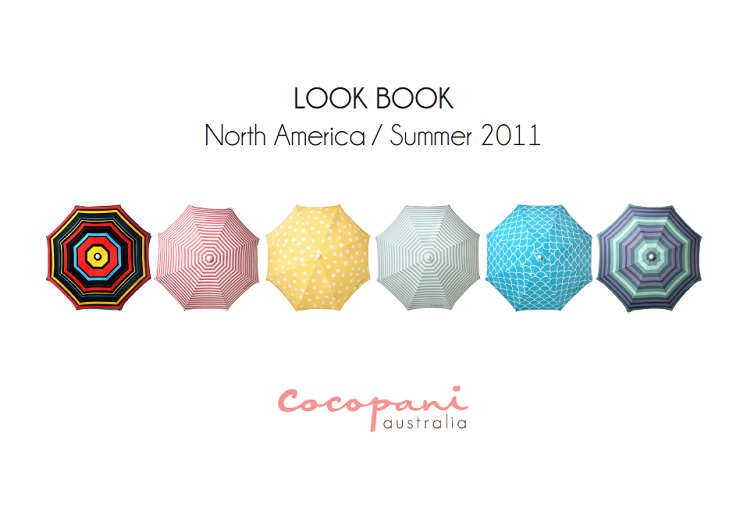 I like Cocopani Australia on FB! Thanks for visiting Fashion Truffles today. I hope you stop by again soon! i follow on GFC: cheryl denise. would love to win the watermelon one!!! i follow you on twitter - apeekofchic. i would love to win the watermelon one! i tweeted about your giveaway - apeekofchic. would love to win the watermelon one! Nice posting "outdoor products " .. This is the first time I have come across your-site. Post info, I’ll be back soon. Thanks!